Colour: Outside grey, inside red. Temperature Range: - 25°C + 60°C. 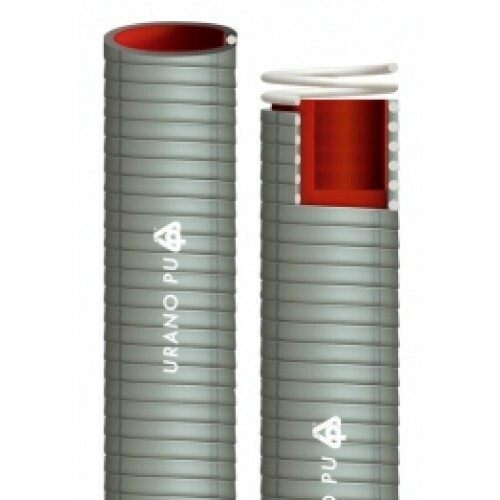 Technical features: Very strong hose made of two layers: the external one is in PVC reinforced with an anti-shock PVC helix. The inner surface is completely smooth and consists of a Polyurethane layer of 1.2 mm. Properties: The hose is appreciated for its excellent resistance to abrasion and vacuum in heavy duty applications,resistant to ageing, ozone, UV rays, hydrolysis, weather conditions. It can be manufactured in antistatic version adding a copper wire. Suction and delivery of abrasive materials such as sand, cement, gravel, stones. It is used also in shot blasting and in all those applications where resistance to abrasion is needed.